Getting ready for an upcoming carving class that #2 and I will be attending, I was looking around for carving info on the web. I wandered onto the forums at Woodcarving Illustrated where I found a golf ball carving tutorial by Gene Messer. After some more searching around the net, I ended up on YouTube where I found that Gene has recorded lots of video tutorials, including a series on carving and painting a golf ball. The ball on the right is the one I carved after reading the tutorial. It was painted after I’d found Gene’s videos. 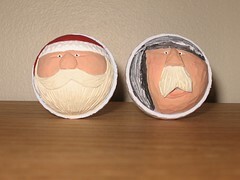 After thinking about it and watching some of Gene’s Santa carving videos, I came up with the Santa face on the left. I’ve posted three projects over at my LumberJocks project page. Last Wednesday (25 Feb 2004) the editors and woodworkers of Popular Woodworking held an open house, shop tour, and infill plane building demonstration. The evening opened with a nice dinner supplied by PW in their company lunchroom. I was pleasantly suprised by the turnout there were lots of woodworkers in attendence and we completely filled room. I'm bad at estimating crowds, but I'd guess there were 75+ people there. All of the woodworker/editors of PW were there to meet their readers and woodworking guests. After dinner it was time for a quick tour of their new shop. Previously the PW shop was in the basement of an interesting old Art Deco building near the Xavier University campus. While the old shop was bigger it suffered from a lack natural lighting (the only windows were covered by grates and foliage). The new shop is smaller but had four giant windows where the editors have their handwork benches setup. 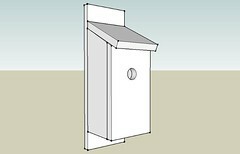 They also gained a nice set of loading dock doors to make moving lumber and projects easier. While we were touring the shop, the lunchroom was switched over for the presentation on building an infill plane by Doug Evans and Ben Knebel of the Shepherd Tool Company. After some computer problems (love that Windows 98) Doug started talking about infill planes while Ben got busy being funny and building their small chariot block plane. It was truly amazing at how fast Ben can put a plane together. In less than two hours he had dovetailed the brass sides and steel sole together, added the infills and riveted them into place, draw filed the peened over dovetails, and beltsanded the sole and one side to a nearly finished state. When Ben and Doug say anyone can make their own chariot plane in just a few hours I can believe it now, since Ben spent a lot of his time joking and talking rather than strictly working on the plane. While getting links for this article, I just found that Shepherd Tool now has a thumb plane kit that is only $69.95. Looks like a great way to try out making one of their planes and getting a great looking tool as part of the process. I'm looking forward to going back and visiting in the PW shop if the plans work out for a couple of demonstrations work out like the PW editors would like. Using a router fence with bearing bits? Watching the Router Workshop yesterday, I found myself questioning why the hosts kept setting up a fence so that the bearing portion of the router was flush with the fence. A few minutes later I got my answer. Seems I probably wasn't the first person to ask them that question. By setting the fence up flush with the router bit bearing you reduce the chance of slight variations in the edge getting telegraphed through the bearing and into the workpiece.